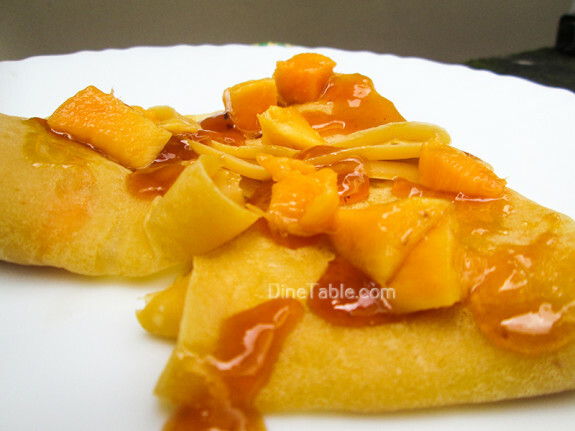 Mango crepes are delicious mango stuffed pancakes and garnished with caramelized mango. 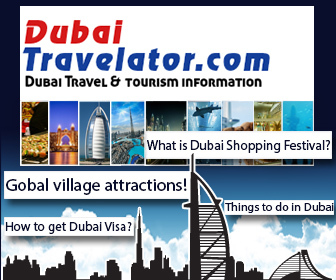 It is a very easy and simple recipe which can be prepared in less time. Kids will really love this recipe. We have to make thin crepes first, which are thin pancakes, with all purpose flour and milk. 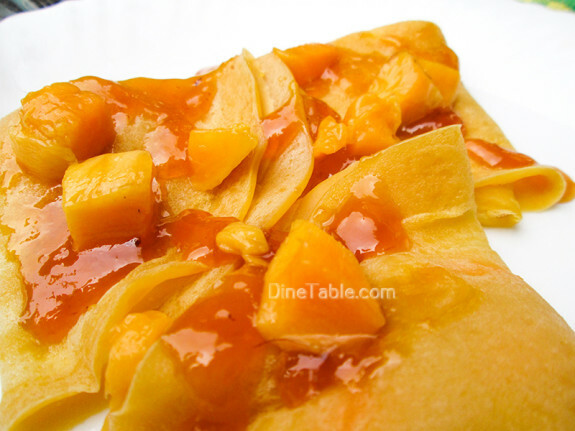 I have added mangoes to the pancake batter for the taste and flavor of mangoes. The crepes are then filled with mangoes and garnished with caramelized mangoes. 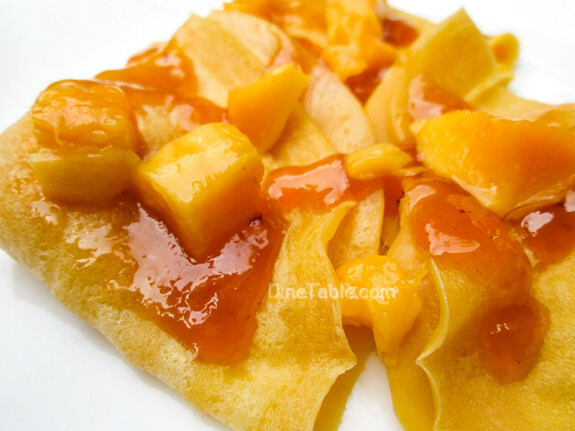 You can garnish your mango crepes as you desire with cream, honey or any other toppings. Click here for other delicious Mango Recipes..
Take a bowl and add all purpose flour, corn flour, salt and water. Mix nicely with a spoon to make a thin batter. Add mango pulp and oil to the batter. Mix nicely. Heat a little oil in a pan and wipe with a tissue paper. Pour one ladle full of batter, rotate it and pour excess batter into the same bowl. Cook it for 30 sec and transfer into a plate. Prepare crepes with the batter like this. 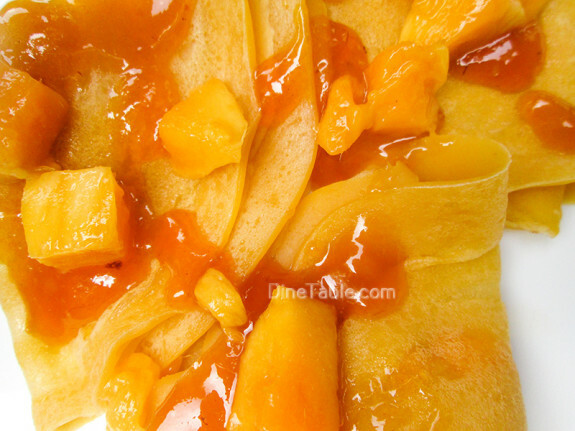 For making mango filling, take a bowl and add mango and caster sugar. Mix it. 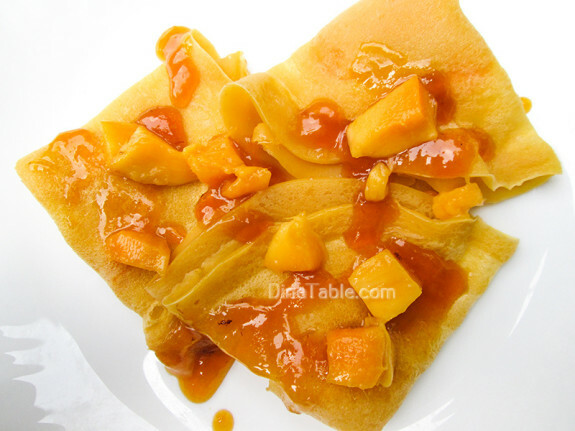 Place some mango filling on each crepe and fold the crepe into triangle shape. Heat another pan and melt 2 tbsp sugar. Once sugar is caramelized, add 1 tbs mango pulp and mix nicely. 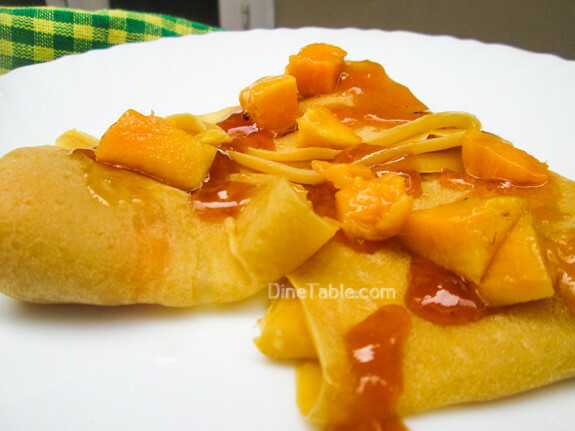 Take a serving plate, arrange stuffed crepes and pour caramelized mango syrup on them. Garnish with mango pieces. Yummy Mango Crepes are ready to serve.